If you like your smartphones premium - and we're talking 'do the colors coordinate with my yacht?' premium - then listen up: snazzy phone maker Vertu has teamed up with car creator Bentley to make a range of smartphone so luxurious that they'll probably be coated with your financial advisor's tears. If you're already closing the browser window, we can understand why. The Vertu Signature Touch costs a cool £6,750 (most of which probably goes towards its absolutely-necessary solid sapphire screen coat) and it's not like the Bentley name is going to remove any value. 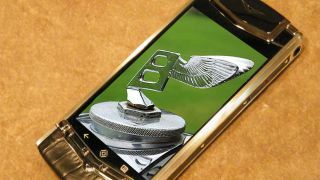 The first of the 'Vertu for Bentley' phones will arrive this October, with four more handsets to arrive over the course of the duo's five-year partnership. We expect these will be running Android like the rest of Vertu's smartphones. The phones will also come with some exclusive Bentley content that'll be delivered via an app. Perhaps it'll be some handy tips on how to save pennies by recycling those old shampoo bottles. Or maybe it'll be the coordinates to your complimentary island.